Our Services – Always Advanced, Always Efficient. KBA offers the most advanced land clearing solutions available. Covering a wide range of requirements, we work with a variety of clients from farmers, construction companies and estate owners. 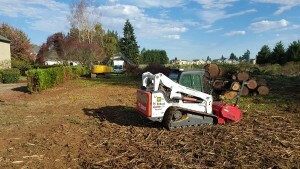 With our advanced land clearing techniques, we have established ourselves as the number one choice for land clearing. Our state of the art mulching equipment means we can tackle any project, regardless of the type of vegetation, volume or density. From agricultural pastures to dense forest, our advanced equipment and expert team of land clearing professionals is ready to deliver. With forestry mulching heads mounted on rubber tracked crawlers and full sized excavators, we are ready to handle any project. Latest Land Clearing Technology for Environmental Benefit. We always strive to offer the latest and best techniques for land clearing. We are proud to offer an industry leading mastication service which grabs and grinds vegetation into a nutritionally rich mulch which benefits the soil and prevents erosion, as recognized by the EPA. When land clearing, we often want to keep certain kinds of vegetation, whilst controlling others. Mulching achieves exactly that. We use this method rather than bulldozing which simply destroys everything in its wake. Mulching with our state of the art equipment allows for the “waste” to remain on the ground, which is actually an extremely valuable ecological resource, as it decomposes and releases much needed nitrogen supporting the growth of desired vegetation. Mulching also protects soil by cutting trees down to ground level, instead of uprooting them. Unlike bulldozing it is quicker, safer and more environmentally beneficial. It also allows for more precise and targeted land clearance as opposed to bulldozing which can cause unintended damage. The benefits of this latest technique are: Faster and more efficient, Reduces amount of waste to be taken away, prevents soil erosion, much less disruptive, more environmentally friendly. Our advanced mulching techniques are perfect for restoring and reviving your land, cleaning up after logging activity, creating views and panoramas, creating walking, horse riding and cycling trails, preparing a site for building and controlling unwanted and invasive species. For the best mulching and land clearing service available, KBA Land Clearing is the natural choice. Our advanced techniques combined with an old fashioned work ethic will leave you satisfied every time – call us today! Design by : Infinite Color Inc.